A seventh straight Connacht U21 final beckons for the Rossies. Diarmuid Murtagh helped Roscommon triumph today. THE GOOD TIMES keep rolling on for Roscommon football as their U21 side booked a place in the EirGrid Connacht final this evening with a convincing win over Sligo. This semi-final triumph in Markievicz Park was a straightforward one for a Roscommon team who had claimed a three-point success over Galway in their quarter-final tie. The victory propels Roscommon into a seventh straight Connacht U21 final and they will be bidding for a third straight title. Diarmuid Murtagh and Hubert Darcy struck 0-4 apiece for Roscommon while Henry Walsh bagged 0-3 for the winners and Kevin Farrell hit the only goal of the game. Cathal Henry was Sligo’s primary scorer on the day. 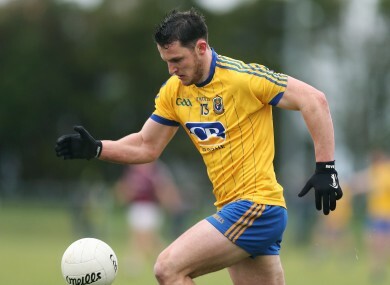 The return of senior Ultan Harney to the Roscommon ranks was a boost after his recent injury problems. Roscommon bossed the game from the start and were ahead 0-6 to 0-2 by the 22nd minute with Murtagh impressing. Then Farrell raised the game’s only green flag and while Sligo fought back before the break, it was still 1-7 to 0-5 at the interval in favour of the Rossies. They continued to command on the scoreboard in the second-half with a Cathal Compton point leaving them in front 1-12 to 0-7 at the midway mark of that period. Darcy then made his mark with some fine late points as Roscommon ran out victors by 13 points. Email “Roscommon maintain Connacht U21 three-in-a-row bid with 13-point win over Sligo”. Feedback on “Roscommon maintain Connacht U21 three-in-a-row bid with 13-point win over Sligo”.